Using a manually fired kiln can be an exercise in frustration and often results in ruined projects and wasted glass. Using a programmable controller allows you to run your kiln accurately and effortlessly. Set the program, hit the start button and go. You will get reproducible results without having to hover about your kiln watching the needle on the pyrometer. 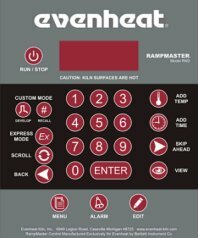 EvenHeat controllers are available as a factory installed option for your kiln. They can also be purchased separately to run an existing kiln (see Wall Mount RampMaster II below). 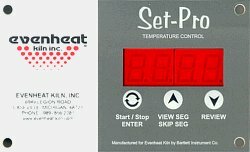 EvenHeat controllers use computer technology to give you accurate and consistent control for each firing. # Express Mode: Allows you to enter COE of the glass you are firing, your firing style (slumping, tack fuse, full fuse or casting) and the speed you wish to fire at to quickly program your firing with only a few keystrokes. # Delay Feature: Allows you to specify the amount of time before a program starts after pressing the "start" button. Up to 100 hours of delay is possible. Perfect if your electricity is metered for "off peak" usage. # End of Process Alarm: Notifies you when the program wraps up the process phase and enters the annealing phase. # # Bright LED Display: Display shows 4 characters in large, easy to read from across the room format. # Suspend the Firing: You can hold the firing at the displayed temperature for up to 15 minutes. Your program then resumes where you suspended the firing. Also called "Pause"
# # Add Temperature: Allows the addition of 5° increments to your set point. The SetPro and RampMaster III Controllers are also available as a Wall Mount unit for use with an existing manually controlled kiln. The manually controlled kiln is "plugged into" into the Wall Mount Control. The Wall Mount is then "plugged into" the power supply. Beyond that, the thermocouple is inserted into the kiln and it's ready to go! What do I need to know when purchasing a Wall Mount Controller? You'll need to provide the voltage, phase, amperage and plug configuration of the kiln. Voltage, phase and amperage is found on the kiln nameplate. To determine plug configuration either contact an electrician or look to our receptacles chart below. Note: All Wall Mount controllers are a special order items, built for your specific kiln. Please allow 1-2 weeks for factory lead time plus delivery time. Note: These controllers use a type K thermocouple. Type S thermocouples are available at extra cost. Don't see the plug/receptacle you need? Just e-mail us with the details and we can special order the proper item for you. Our Wednesday Walk-in Discount DOES NOT apply to Wall Mount Controllers.